At Forest Hills, New York, Maria Bueno of Brazil beats Nancy Richey of Texas to take the U.S. Women's Title. Fred Stolle battles Australian team-mate, John Newcombe to win the Men's title in a four set struggle. It's Stolle's first major tournament win. High Angle Shot as Women play tennis on the tennis court at Forest Hill, New York.Tennis enthusiasts watch the game in play and applaud. High Angle Shot of a match between Maria Bueno and Nancy Richey in progress. High Angle Shot - Tennis fans stand and applaud as the women shake hands. CU Maria Bueno of Brazil holding up her trophy. High Angle Shot Fred Stolle and John Newcombe walking on to the tennis court. The match in progress. Spectators watch and clap from the packed stands. CU Fred Stolle holding his US Open Tennis trophy. Manuel Santana of Spain wins the Men's Single Title at Wimbledon beating America's Dennis Ralston. America comes back, however, as Mrs. Billie Jean King tops three-time Wimbledon Women's Single Champ, Maria Bueno of Brazil. Wimbledon tennis stadium and crowds walking around on the outside . Mens Final: America's Dennis Ralston serving to Manuel Santana of Spain. Various shots between the two men. Ralston misses at match point. The win goes to Manuel Santana. High Angle Shot of cheering and applauding tennis fans. Women's Final: Billie Jean King serves to Maria Bueno of Brazil. Applauding audience. Various shots of the women volleying the ball. Billie Jean King serves for match point and wins. They shake hands as the crowds cheer and applaud. High Angle Shot - Billie Jean King receiving her trophy from Princess Marina. CU of Sports fans applauding Billie Jean. CUS - Billie Jean King in retro 60s glasses holding up her trophy above her head. US OPEN Manuel Santana Becomes the first player from Spain ever to win the tennis championship of the United States and Margaret Smith of Australia proves that she is Top woman player as she adds the American title to the Wimbledon crown she already wears. Santana sets back Cliff Drysdale of South Africa, while Miss Smith takes the measure of Billie Jean Moffitt (Billie Jean King) of the United States. US Woman's Singles. High Angle Shot - Tennis Fans MS - Margaret Smith serving. High Angle Shot - Match point and Margaret Smith takes the title. High Angle Shot - Cliff Drysdale of South Africa serves to Manuel Santana of Spain. MS - Santana serves. High Angle Shot - Drysdale of South Africa serves. High Angle Shot - Fans applauding. High Angle Shot - Match point, Santana serves and he wins. CUS - Manuel Santana holding his wining loving cup trophy. Audio is low on screener America's tennis prestige is recouped at Forest Hills. Tony's who is the favorite own prestige is recouped beating Ken Rosewall of Australia in the US National Championship. Tony blazed to victory in straight tennis sets. MLS - Tony and Ken hitting the tennis ball back and fourth. MLS - Tennis fans cheering. MLS - Tony and Ken hitting the tennis ball. Tony hits the ball and Ken can't touch it. MLS - Tennis fans cheering and applauding. MCUS - Throngs standing around the Champion, Tony Trabert and Ken Rosewall of Australia. Audio is low on screener Tony Trabert wins the men's finals in the Wimbledon tennis classic, defeating Kurt Nielsen of Denmark in straight sets. Establishing shot - Tony Trabert and Kurt Nelson of Demark bow to the Princess Margaret and the Duchess of Kent. CUS - Tarbert serving. CUS - The Sports spectators applauding. CUS - Nelson serves. CUS - Trabert wins and shakes hands with Nelson. CUS - Nelson receives his Trophy from the Duchess of Kent. Aussie's Lew Hoad and Ken Rosewall square off in the finals of the US Men's singles. Hoad is seeking a grand slam of amateur tennis, a feat not accomplished in 18 years. And little Ken Rosewall plays a blazing, unbeatable game, to defeat his hopes, and become the new US Singles champ, in a day of unforgettable tennis. Hoad wins the first set, 6 to 4. Rosewall puts it away taking the second set. Establishing shot - One of the players tosses his racket and it lands on the tennis courts out line. CUS - Lew Hoad and Ken Rosewall. MS - Sport spectators. OHM - Hoad serves. MS - Rosewall serves. LLOH - Throngs of tennis tans applauding. MSOH - Hoad serves and Ken Rosewall wins the US Singles Champ. CUS - Rosewall holding his trophy and plate. 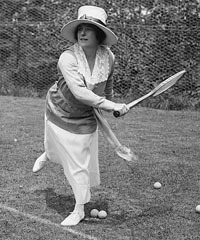 Tennis Grand Slam Australian, Margaret Smith, defeated Darlene Hard to take the Women's Singles. Crowd clapping. Sparse crowd of spectators in stands. Two women competitors shake hands. Rod Laver, Australia's phenom, takes the 82nd U.S. Championship in a final match with his countryman, Roy Emerson. This gives him the U.S., Australian, French and Wimbledon, four major titles. Men with trophy and award. Master 1782 - Tape 1 TLS spectators in stands. TLS tennis champion JACK KRAMER (wearing white shorts) serving, volleying during tennis match. TLS tennis champ DON BUDGE (Donald Budge) volleying. Nice 3/4 view MS spectators watching tennis match (no bouncing heads, though). TLS Jack Kramer serving, volleying. LS tennis court during match. Great Schlitz open featuring golden, glittering, rotating Schlitz globe. DO NOT SELL: Archival B&W illustrations & stills of past professional women's tennis players including Helen Wills Moody & Maureen Connolly-- emphasizing the changes in court fashion & the ever-shortening skirt. Excellent montage of 1973 Virginia Slims women's circuit competition, singles & doubles tennis divisions; fashion and action collide; good MS/CUs faces of player's after making bad plays, EVONNE GOOLAGONG, CHRIS EVERT, RAYNI FOX, MARIA REDONDO, JEAN EVERT, JULIE ANTHONY, ROSEMARY CASALS and BILLIE JEAN KING (who gets visibly angry) among them. High angle TLS prolonged service and volley on grass court (women's singles match). MS/CUs "elfish" RAYNI FOX playing singles tennis while wearing skimpy white skirt with frilled trim, her cute pink underwear plainly visible; Ms. Rayni Fox has her hair pulled into long ponytail; note the pink puffs on her socks too. MS/CUs MARIA REDONDO playing on court in fancy white dress, her underwear also plain as the day. MSs JEAN EVERT (sister of Chris Evert) playing singles match in pink dress. MSs long & slender JULIE ANTHONY playing singles match in conventional white dress. Pancho Gonzalez vs. Jack Kramer World Tour TLS seated crowd, indoor arena. High angle LSs first year pro Pancho Gonzalez serving, volleying, earning point against tennis legend Jack Kramer. High angle LS seated crowd applauding. Panning h/a TLS/LSs Jack Kramer serving, volleying, winning point against Gonzalez. Sideview MS young white man in dark-colored suit smiling, applauding. H/a LSs Kramer winning another point, then match. TLS Pancho Gonzalez and Jack Kramer shaking hands at net, then talking and walking toward camera. Teen tennis sensation MAUREEN CONNOLLY becoming US champion. ALTHEA GIBSON winning Wimbledon, being congratulated by QUEEN ELIZABETH. Sideview MCU sweaty Swedish phenom BJORN BORG (then a teenager) drinking water; MSs long-haired Bjorn Borg serving, volleying during single's match; TLS/MS Bjorn Borg beating ARTHUR ASHE, the two cordially shaking hands post-match. MS VIJAY AHRITRAJ walking onto court w/ young woman carrying several raquets, smiling at camera; MSs Vijay Ahritraj serving, volleying. MSs Men's No 1 seed ILIE NASTASE playing timidly, losing early at 1973 U.S. Open. MSs BILLIE JEAN KING playing, getting frustrated, eventually losing to JULIE HELDMAN, who wears a poofy, goofy white hat. MSs BILLIE JEAN KING playing, getting frustrated, eventually losing to JULIE HELDMAN, who wears a poofy, goofy white hat. Great MS two young white women in sunhats & sunglasses looking bored, one wearing a skimpy yellow bikini top; MSs dejected Billie Jean King & elated Julie Heldman walking off court post-match, hugging people. 1973 U.S. Open: Tilt down LS "Love Tennis" in skywriting to packed spectator stands; nice TLS/LSs audience applauding at center court. 1973 U.S. Open: MS montage women's legs as they play on no-bounce court; a study of exposed thighs, calves, knees. 1973 U.S. Open: TLS/MS women's doubles, team of BILLIE JEAN KING & ROSEMARY CASALS in far court. MS/LSs men's doubles match featuring ROD LAVER and KEN ROSEWALL. 1973 U.S. Open: TLS audience watching, coming to applause, line judge in FG. Nice MS/TLSs women's doubles final match pitting Billie Jean King & Rosemary Casals against VIRGINIA WADE & MARGARET SMITH COURT. TLS audience crowd. 1973 U.S. Open: Women's doubles final match pitting Billie Jean King & Rosemary Casals against VIRGINIA WADE & MARGARET SMITH COURT. 1973 U.S. Open: Women's doubles final match pitting Billie Jean King & Rosemary Casals against VIRGINIA WADE & MARGARET SMITH COURTends w/ MS Billie Jean King missing volley, turning around & looking dejected; Wade & Court won the final. 1973 U.S. Open: MS montage CHRIS EVERT, HELGA MASTHOFF, EVONNE GOOLAGONG, MARGARET SMITH COURT, ROSEMARY CASALS playing women's singles matches. 1973 U.S. Open: LS/MSs Helga Masthoff vs. Evonne Goolagong women's singles match. 1973 U.S. Open: LS/MSs Helga Masthoff vs. Evonne Goolagong women's singles match. Goolagong wins, advances to final. TLS crowd applauding. 1973 U.S. Open: MS adorable CHRIS EVERT unzipping, checking Wilson tennis racket on court while press photographer looms over her; MS/LSs Chris Evert vs. Margaret Smith Court women's singles match. 1973 U.S. Open: TLS crowd applauding. MS/LSs Chris Evert vs. Margaret Smith Court women's singles match. 1973 U.S. Open: MS/LSs Chris Evert vs. Margaret Smith Court women's singles match. Court wins, advances to final. TLS audience applauding. 1973 U.S. Open: MS/LSs Men's singles semi-final match between JOHN NEWCOMBE & KEN ROSEWALL. 1973 U.S. Open: TLS crowd applauding. MS/LSs Men's singles semi-final match between JOHN NEWCOMBE & KEN ROSEWALL. 1973 U.S. Open: MS/LSs Men's singles semi-final match between JOHN NEWCOMBE & KEN ROSEWALL; nice TLS electronic scoreboard showing players & score, tilt down to match in progress. 1973 U.S. Open: MS/LSs Men's singles semi-final match between JOHN NEWCOMBE & KEN ROSEWALL; Newcombe wins, advances to final. 1973 U.S. Open: MS electronic scoreboard: "Jan Kodes versus Stan Smith"; MS/LSs Men's singles semi-final match between JAN KODES & STAN SMITH; excellent back & forth action, hard engaging play. 1973 U.S. Open: MS/LSs Men's singles semi-final match between JAN KODES & STAN SMITH; TLS/MSs players wiping off faces w/ towels between sets; excellent back & forth action, hard engaging play. 1973 U.S. Open: MS/LSs Men's singles semi-final match between JAN KODES & STAN SMITH; excellent back & forth action, hard engaging play. 1973 U.S. Open: Men's singles final between JOHN NEWCOMBE & JAN KODES; TLS/MSs tennis action. 1973 U.S. Open: Men's singles final between JOHN NEWCOMBE & JAN KODES; TLS/MSs tennis action; good C/A MS/TLSs crowd watching, applauding-- inc one fella wearing famous silver-rim Elvis sunglasses. 1973 U.S. Open: Men's singles final between JOHN NEWCOMBE & JAN KODES; TLS/MSs tennis action; TLSs crowd watching, applauding. 1973 U.S. Open: Men's singles final between JOHN NEWCOMBE & JAN KODES; TLS/MSs tennis action; TLSs crowd watching, applauding. TLS match point, Codes leaping & missing the "violent" serve; LS/MSs Newcombe leaping over net to shake Kodes' hand after winning. 1973 U.S. Open: Women's final between MARGARET SMITH COURT and EVONNE GOOLAGONG: CU Evonne Goolagong, zoom out to MS Goolagong posing w/ Margaret Smith Court; MS/TLSs tennis action. 1973 U.S. Open: Women's final between MARGARET SMITH COURT and EVONNE GOOLAGONG: TLS crowd. MS/TLSs tennis action. 1973 U.S. Open: Women's final between MARGARET SMITH COURT and EVONNE GOOLAGONG: TLS crowd. MS/TLSs tennis action. TLS Smith & Goolagong shaking hands post-match. LS large crowd in stands. CU sweaty Smith surrounded by photographers. Alice Marble wins the U.S. Women s singles championships by defeating Helen Jacobs, the four-time winner.